As a result, certain aspects of this web site may not perform as intended. Click here to view paintings. Howard Post is one of todays most sought after artists. 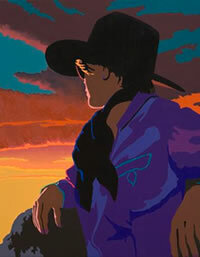 His impressionist paintings capture the West and contemporary ranch life with unique perspective and breathtaking color. Born and raised on a ranch in Arizona, Howard is a true cowboy, and continues to compete as a member of the Professional Rodeo Cowboy Association. Howard Post paintings are collected around the world, and are represented in numerous private, public, and corporate collections, including The Denver Art Museum, The Cody Museum, The Smithsonian Institute, ATT World Headquarters, United Airlines, and the United States Postal Service. “San Tan Valley”, oil on canvas, was recently chosen by the Western Art Association to be included in the permanent collection of Phoenix Art Museum in Phoenix, AZ. 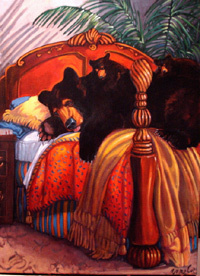 He won Best of Show for his painting, “The Neighbor’s Favorites” at the 2010 Coors Western Art Exhibit in Denver, CO.
Howard Post is one of twelve featured artists at The Rockwell Museum of Western Art in Corning, NY, in the new exhibition “21st Century Regionalists : Art of the New West”. Anne Coe is widely known for her sometimes fanciful, sometimes disturbing interpretations of life on earth. She studied art independently in Europe and at the University of Puerto Rico, and she received her Masters of Fine Arts degree at Arizona State University in 1980. She has had the Cover articles in the Southwest Art (June 2005), Wildlife Art News and Art Today as well as a number of newspapers and periodicals. She also illustrated Here Is the Southwestern Desert for Hyperion Publishing. She is featured in several books: Drawn To Yellowstone by Peter Hassrick, Leading the West: 100 Contemporary Painters and Sculptors by James Haggerty and Humor In Art by Nicholas Roukes. Her work is included in numerous public and private collections such as the Whitney Museum of Western Art, Smithsonian Institution, Glasgow Museum of Contemporary Art, Eiteljorg Museum, Midwest Museum of American Art, Museo de bellas Arte, Guadalajara, Mexico, The Figge Museum and McDonald's Corporation. Ms. Coe is involved in many community arts and conservation projects. She is co-founder and chairman emeritus of the Superstition Area Land Trust. She is on several boards and commissions and has been appointed by two Arizona governors to serve on the State Land Conservation Advisory Board. Ms. Coe is a fourth generation Arizonan. She grew up on a ranch in the southern part of the state. Currently a Professor of Art at Centeral Arizona College, she lives on the slopes of the Superstition Mountains in the high Sonoran Desert. 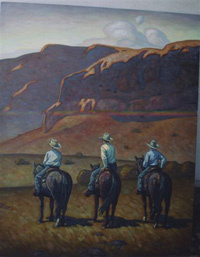 Billy Schenck paints images of modern Western America. In his own words he explains, "My style of painting becomes a marriage of my earliest romantic remembrances of the West and my artistic roots in the 'pop' painting of the early 1960's." Chosen by a group of art historians including Peter Hassrick, Denver Art Museum; and Don Haggerty, author and head of the Art History Department at UC-Davis, Schenck was included in the "Masters of Western Art 1900-2000" show held at the Desert Caballeros Museum. Since 1970, he has participated in over 87 solo exhibitions and 64 museum shows in the United States and Europe. His work can be seen in over 100 major collections, including The Denver Art Museum, Albrecht Kemper Museum of Art, Whitney Gallery of Western Art, Tucson Museum of Art, and Scottsdale Center for the Arts. Other public and corporate collections include Sky Harbor Airport, Mayo Clinic, McDonalds Corporation, National Bank of Switzerland, American Airlines, Wells Fargo Bank, and IBM. Oil on canvas - 15" x 30"
Jeffrey Bozik is an Americain painter born in Washington DC in 1970. He studied Fine Art and Art History at The Univesity of North Carolina under Ann Conner and privately with Saant Celia. His paintings are done in the classic Italian Academic manner and vary in subject. Copyright © 2019 by Sally Hendrickson Fine Art & Treasures All Rights Reserved.